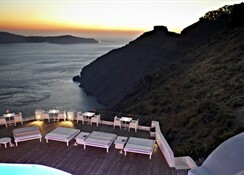 The Sun Rocks Boutique Hotel is an exclusive, luxury, adults-only hotel in Firostefani, Santorini Island, Greece. The property, which oversees the breathtakingly beautiful Aegean Sea, is 300m above the sea. The hotel is set against the sea and the volcanic remains of the island. The Kamari Beach is located just 12km away from the hotel. Guests can take a refreshing dip at the outdoor and indoor swimming pools. It has 18 tastefully decorated guestrooms. 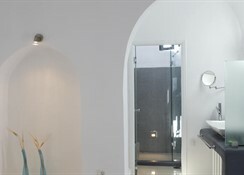 The modern luxury hotel has a décor with elements of traditional Cycladic and Greek architecture. The hotel offers all modern-day luxury facilities like Jacuzzi, hot tub, indoor heated pool, among others. The hotel’s destination guarantees the vacationers a peaceful beach holiday. The hotel’s adults-only policy makes it an ideal destination for couples looking to spend a romantic vacation. 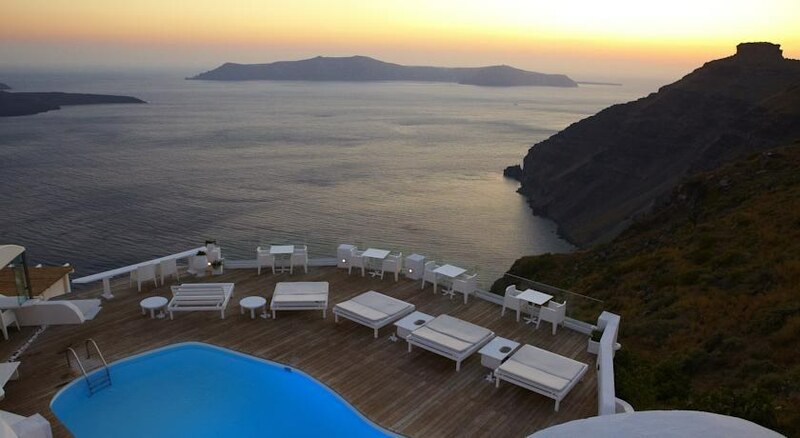 The Sun Rocks Boutique Hotel is located 8.7km away from the Santorini International Airport. The closest beach, Monolithis Beach, is 9km away from the property. Santorini town is located 8.7km away from the hotel. The town of Kamari is located 11.7km away from the hotel. The nearest bus station is 1km away from the hotel. Local landmarks and popular tourist destinations like the Megaro Gyzi, Archaeological Museum of Thera, Museum of Prehistoric Thera, karos, Volcano, Santorini Port, Art Space Santorini, Monolithos Beach and Cape Columbo Beach are located within a range of 5km from the hotel. 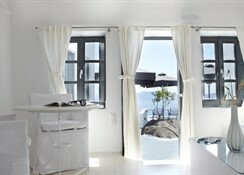 The Sun Rocks Boutique Hotel houses 18 guestrooms which have been decorated with influences of the traditional Cycladic and Greek and architecture featuring prominent white and blue colours. The rooms are categorised based on size and amenities. The hotel has accommodation options like Double Room, Junior Suites, Superior Suites with Open Air Jetted Tub, Experience Jetted Tub Suites, Honeymoon Jetted Tub Suites and Sun Rocks Suite with Private Pool. All the rooms are equipped with essential amenities including free Wi-Fi, air conditioning, satellite TV, direct dial phone, safe deposit box, mini bar, coffee machine, hair dryer, bathrobes, slippers, bed linens, essential toiletries, etc. The rooms are regularly maintained by the house keeping staff and serviced by the room service staff. The Sun Rocks Boutique Hotel houses a restaurant and bar that serves a variety of international and local Greek cuisines. The onsite restaurant is popular for its inventive delicacies involving local tastes and flavours, and breathtakingly beautiful view of the sea. The hotel’s proximity to the towns of Kamari and Santorini allows the guests to try out multiple restaurants and bars that serves local as well as international cuisines. The Sun Rocks Boutique Hotel houses outdoor and indoor swimming pools that serve as a great spot for the guests to take refreshing dips with a view of the Aegean Sea. The hotel also has a poolside bar for the guests who would like to enjoy the poolside view with some alcoholic beverages. The hotel also houses a high-end spa where the guests can have a great time and pamper themselves. The hotel also has facilities for snorkelling, horse riding, diving, cycling, hiking, canoeing, windsurfing and fishing for their guests.